In 2017, Stromness celebrated a huge milestone in its history by marking 200 years since it became a Burgh of Barony. Becoming a Burgh of Barony allowed the town to take control of its own affairs, establishing a town council and taking as its motto ‘Per Mare’ meaning ‘by the sea’, a nod to not only its geographical location, but to the life blood that has sustained the town for generations. Folk from all across the town came together for a series of events which shared three common themes – remembering and exploring the history of the town, celebrating everything that the town has now and imagining the future. 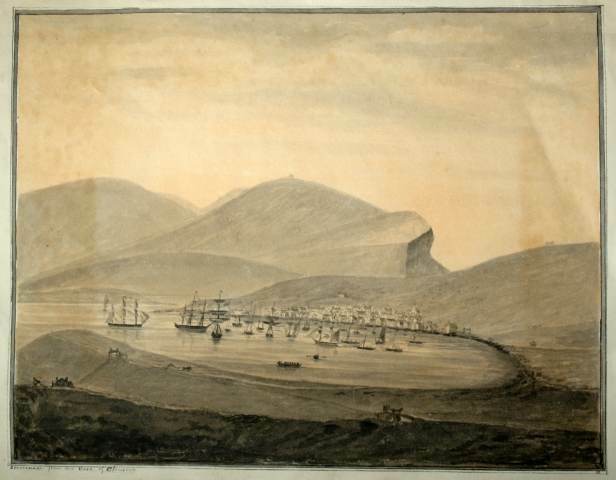 The town of Stromness takes its name from the parish in which it lies and is from the Old Norse straumr nes, meaning the headland in the tidal stream. The town grew up by the shores of Hamnavoe, Hafnarvágr, the haven bay, where ships could shelter safely in a deep water anchorage. The writer Jo Ben refers to the suitability of waters around Stromness in an account from the mid-16th century. 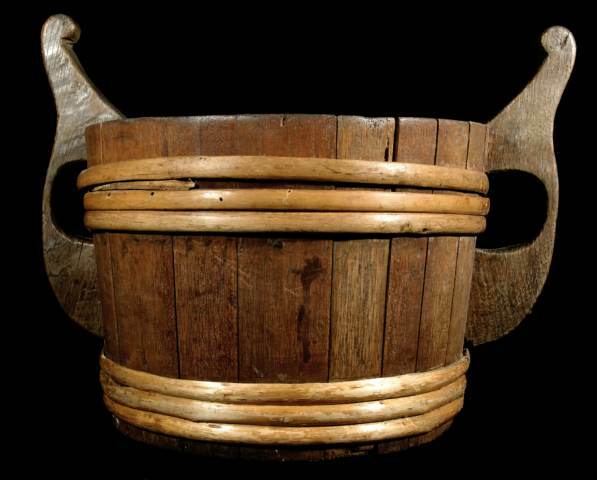 He states that “The French and Spanish very often avoid storms here.” It was the presence of these visiting ships that prompted William and Mareon Clark to build an inn on the shores of Hamnavoe around 1590, selling the ale that they made to passing sailors. This first building was not where the town was to develop, but on the N.E. corner of the bay near to where Stromness Academy now stands. Stromness was a ‘dry town’ between 1920-1947, but it once had a reputation of being a good place for refreshment. When John Gow the pirate returned to Stromness from his piratical dealings in 1725 he is said to have drunk at the White Horse Inn, where he scratched his name on a window pane. The café at the Pier Head was once the Arctic Whaler Inn; the name hints at the target market. Login’s Inn, called The Ship Inn, was more up-market. Login not only supplied drink to the sea captains, but also water from the well for their ships. The well still exists today, though is no longer in use. In 1825-6 there were 12 pubs in Stromness with names like Britannia, Crown & Anchor, Jolly Sailor, Mason’s Arms, Pilot’s Inn, Rose & Crown, as well as three Ship Inns. There were also many private dwellings where home-brewed ale could be consumed. The water of the May Burn flows past the museum and into the harbour. It was used for whisky distilling, first by an illicit still hidden in a vault cut into the rock, then as a legal distillery. Stromness Distillery was opened by John Crookshank in 1817, producing a single malt called ‘Man O’Hoy’. In the space of forty years it underwent six changes of ownership, before falling into disuse in the mid 1860s. In 1878 it was bought by Macpherson Brothers who renamed the distillery ‘Man O’ Hoy’ and the single malt that it produced was called ‘Old Orkney’. It was a popular malt whisky until the distillery went out of use after 1928 when Stromness was voted ‘dry’. No alcohol was available in the town until after World War II. During the war soldiers washed in the distillery’s mash tubs, but the building was eventually demolished and Mayburn Court was built where it used to stand. This was the home of the writer and poet George Mackay Brown, who often made reference to the old distillery in his weekly column. Visit the Orknejyar website for more information on Stromness, and Orkney in general. 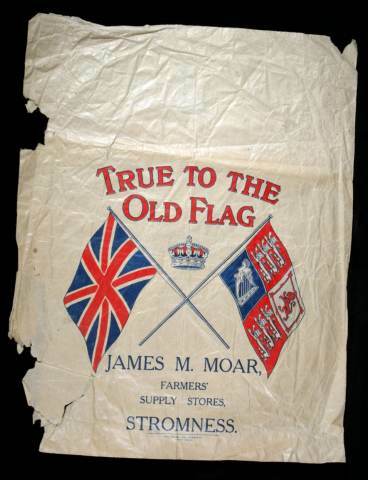 White paper bag, or 'shop poke' from James M. Moar's Farmers' Supply Stores in Stromness. This blue with silver braid rugby cap has an embroidered thistle and the date 1877. It was awarded to Henry Halcro Johnston 1856-1939. 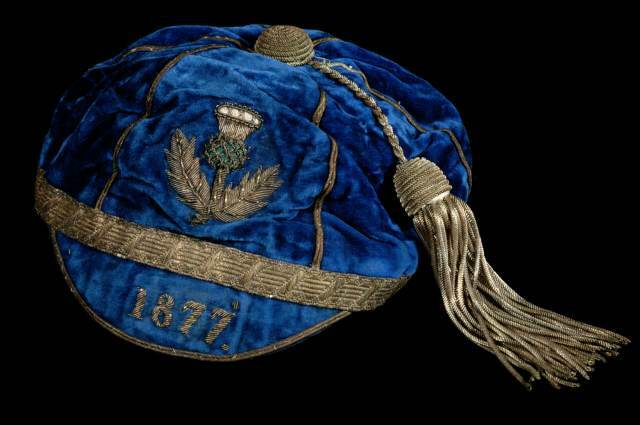 The first Scottish Rugby Union cap - for playing against England and Ireland in 1877. 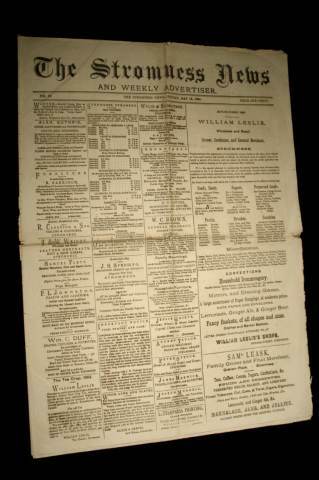 Issue 12 of The Stromness News, dated 16 May 1884. It was published by William Leslie and printed by W R Rendall. Hand-tinted photograph of Barbara Baikie of Bea as New Industry. 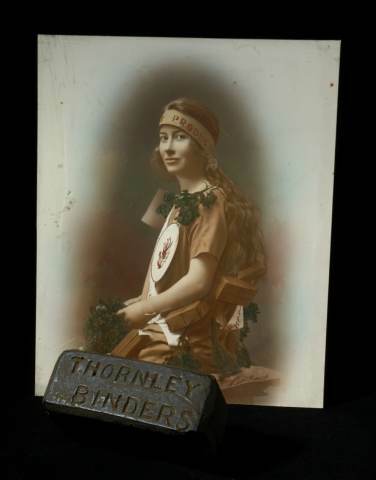 An advertisement photograph for a company called Thornley Binders which produced smokeless fuel made from seaweed. Stromness 1923. 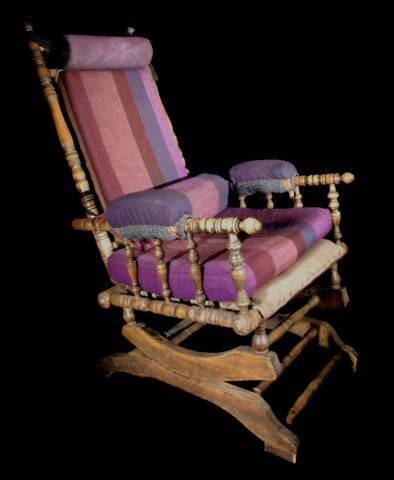 Rocking chair formerly owned by George Mackay Brown, the author and poet who spent most of his life in Stromness. 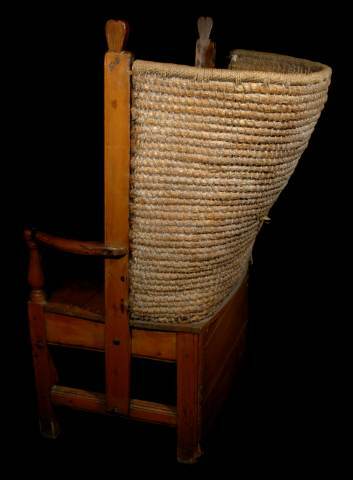 This traditionally built strawbacked chair has unusual carved heart shaped finials on the top uprights. The straw back is also deeper and wider than usual. Height 1115mm, width 635mm, depth 490mm. 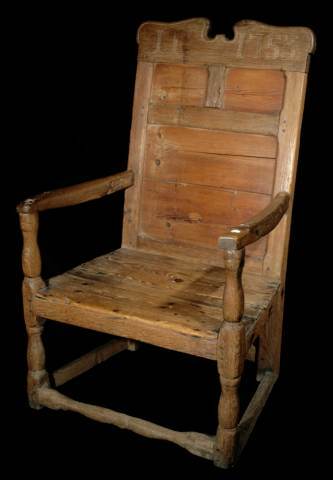 This wooden armchair has a shaped ornamental headboard, carved legs and arms. Height 1015mm, width 480mm, depth 535mm. Bronze metal commemorating the Great Exhibition held at Crystal Palace in 1851. It was won by Mrs J Rendall of Stromness for her straw plait work. Stromness from the Brae of Clouster. A small cubby made from heather. Height 10cm, Diameter 10 cm. 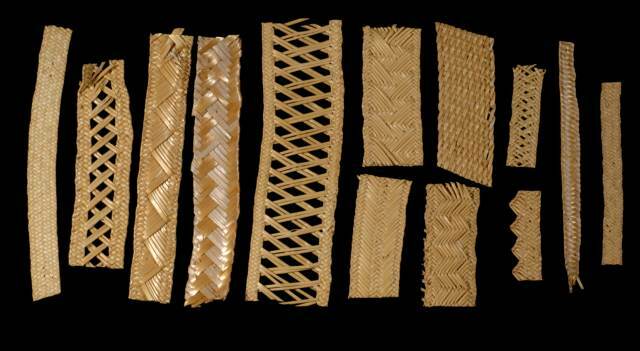 Some examples of straw plaiting. 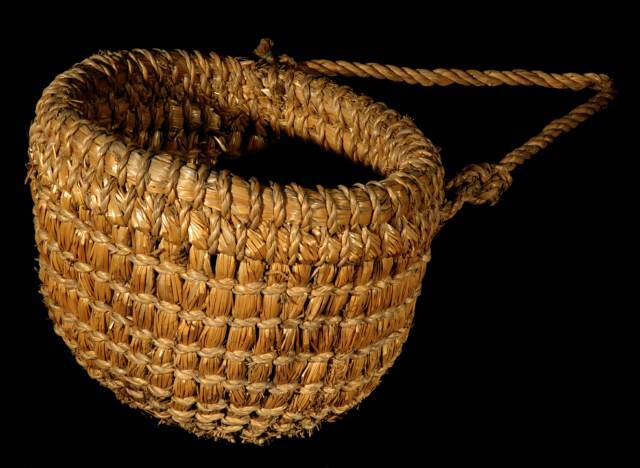 In the 19th century hundreds of Orkney women were employed in making straw plait for the manufacture of bonnets. 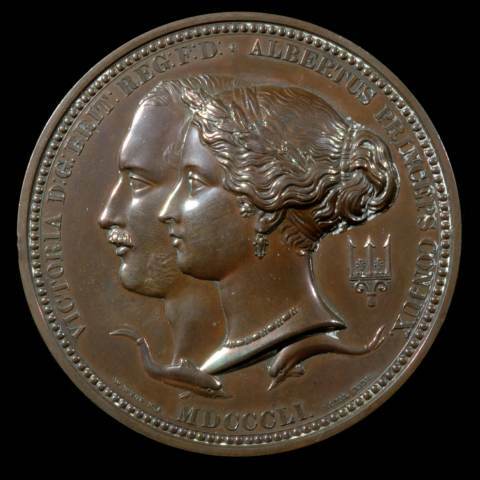 Examples were sent to the Great Exhibition in 1851. 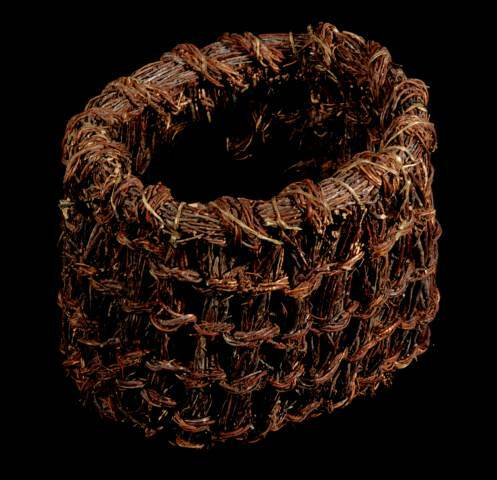 Two horned ale cog (drinking vessel), made of sectors of wood, bound around with willow. Cogs are still used today at Orkney weddings to toast the bride and groom. 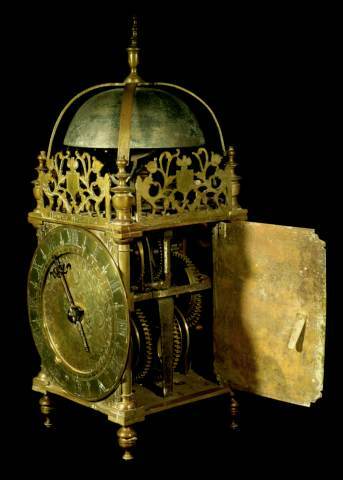 Diameter 10" Height 7"
Lantern clock made by Humphrey Mylles, clockmaker, Edinburgh. 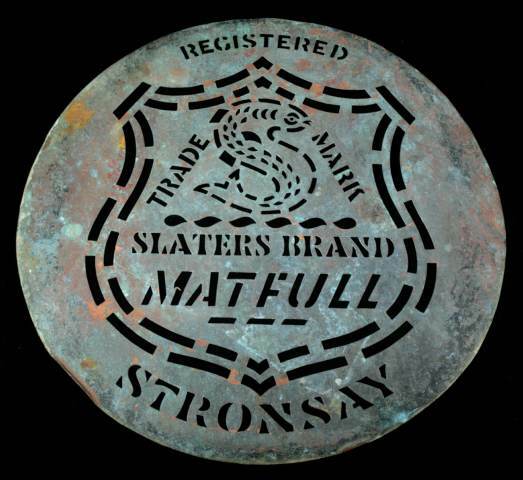 It belonged to the Stewarts of Massater. 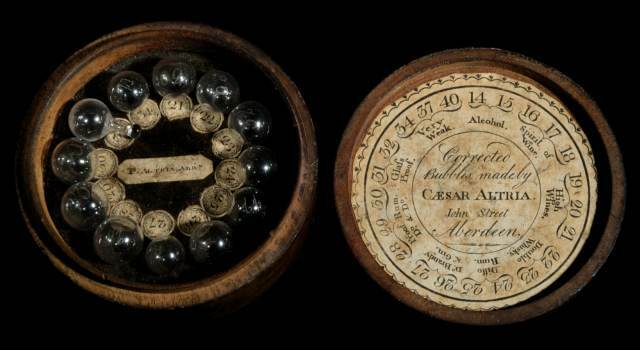 A box containing 12 gravity beads as used by distillers (some of whom were illicit) in testing their product. A small straw-work cubby. Diameter 6 inches. A pin made of bone and carved with a representation of a human face found at the Bay of Skaill.